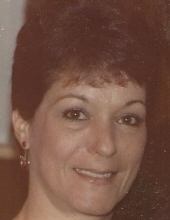 Lola M. (Susi) Allegro, 76, of Brockton passed away peacefully in her sleep on Saturday, February 9, 2019 at her home. Born on January 9, 1943, in Brockton, she was the daughter of the late Michael and Yolanda (Ventresca) Susi. A lifelong resident of Brockton, she was a graduate of Brockton High School class of 1961. Lola was a member of the Polish White Eagles Club and loved painting and art. She was the mother of John DeMinico of Newbury, Carla Lighter and her husband Michael of Bellingham, and the late Michael DeMinico; grandmother of seven grandchildren and one great grandchild; cousin of Leo “Sonny” Narducci of Providence, RI. She was the sister of the late Marilyn Auditore and Louis Susi. She was the dear friend of the late James Nye. A graveside service will be held on Friday February 15 in Calvary Cemetery in Brockton at 10:30AM. Calling hours omitted. Funeral arrangements by Russell and Pica Funeral Home, Brockton. "Email Address" would like to share the life celebration of Lola M. (Susi) Allegro. Click on the "link" to go to share a favorite memory or leave a condolence message for the family.